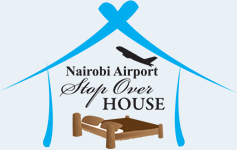 Nairobi airport stop over house is the nearest guest house to Nairobi Jomo Kenyatta airport. Its a convenient bed and breakfast hostel near the Nairobi Jomo Kenyatta airport. Just 10mins drive form the airport, the hostel serves as an ideal layover, stopover, sleepover, or a day room. Airport transfer from Nairobi Jomo Kenyatta International airport or Wilson airport to Nairobi Stopover House or trasfer from Nairobi Stopover House to Nairobi Jomo Kenyatta International airport or Wilson airport. Transfer services are available 24 hours a day, 7 days a week. This is a private transfer. When making a booking, you will need to advise your flight details and your Nairobi hotel or destination details. Your transfer will be confirmed within 24 hours. After you have collected your luggage, our Nairobi airport office representative ( Driver ) will patiently wait for you, holding a sign board reading you names. Look for a sign board reading you names at the arrival terminal. - Nairobi Airport transfers rates / prices are per car not per person. - Payments are in cash after service delivery. Payable to the driver when he drops you to the Nairobi guest houses, Nairobi hostels, Nairobi Cottages, Resorts and campsites or to any other Nairobi environs transfer services requested. * This transfer must be booked at least 72 hours in advance of your travel date. * The duration of transfers are approximate. The exact duration will depend on the time of day and traffic conditions. * Please note, the brand of vehicle used may vary depending on your specific travel date. * Each traveler is allowed maximum 1 large and 1 small suitcase. Oversized or excessive luggage (e.g. surfboards, golf clubs or bikes) may have certain restrictions, please inquire with the supplier prior to travel to confirm if your excess luggage is acceptable.